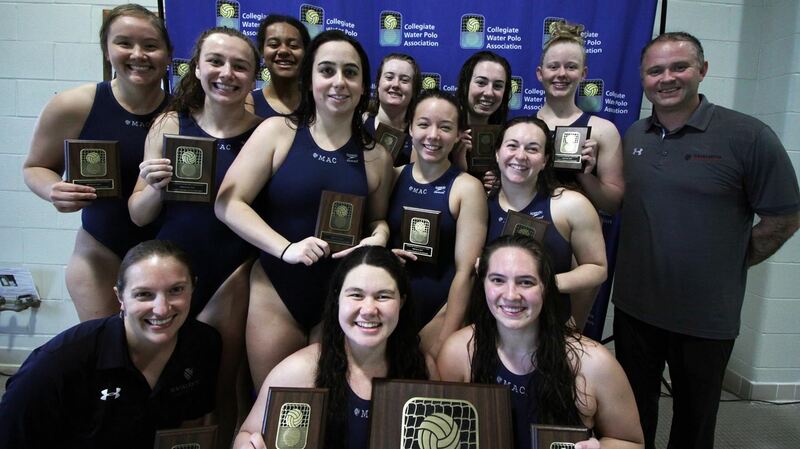 Rankings held steady across the board as there were no upsets among the CWPA Top 25 on Week 12 of women’s water polo action, but the CWPA Division III title was awarded as were a handful of other conference crowns. The big matches of the week saw #1 Stanford edge out #4 Cal 13-12, #2 USC pummel #10 Arizona State 17-3 and #5 Hawaii best #11 UC Santa Barbara 15-9. With the victory, Stanford locked down the top seed in the MPSF Championships, April 26-28. Hawaii grabbed a share of the Big West title with its victory. #6 Michigan registered two Top 25 wins, downing #18 Harvard 17-2 and #18 Bucknell 16-6 in CWPA league games in Lewisburg, Pennsylvania. The victories helped the Wolverines clinch the top seed in the CWPA Championship set for April 26-28, finishing undefeated in league play at 6-0. #6 UC Irvine (def. #15 UC San Diego 11-8) and #8 Pacific (def. #16 San Diego State 12-7) also recorded key victories. The Tigers sewed up their second straight Golden Coast Conference title, remaining unbeaten in league play at 6-0 and earning the top seed in the GCC Championships, April 26-28. #18 Wagner secured the top seed in the MAAC Championship after notching its fourth-straight regular season crown. The CWPA Division III title was decided over 17 matches in New London, Connecticut. In the end, Macalester edged out Austin College 8-5 for the title on Sunday, sewing up its third consecutive championship. Monmouth finished third with a 12-7 win over Carthage. Grove City bested Wittenberg 11-9 for fifth place, while Connecticut College nailed down seventh place with a 13-9 victory over Penn State Behrend. The tournament was not without drama as Washington & Jefferson coach Nikola Malezanov received a red card in the fourth quarter of the team’s Saturday contest with Penn State Behrend, forcing the team to forfeit as the Presidents did not have another institutional representative or assistant coach to take over in his stead. The CWPA cited the NCAA rules in ended that contest and also forced the team to forfeit its next contest due to Malezanov’s suspension due to the red card. “Per National Collegiate Athletic Association (NCAA) Rule 3/Officials – Referees- Control Over Conduct (Article 3, Subsection 3 Red Cards) – “There must be a representative of the institution available to oversee the team when the head coach has received a red card and is excluded from the remainder of the game. Eligible institutional representatives may be declared along with the roster of players before the game, either on the program, if available, or on the scoresheet. If an institutional representative was not declared before the game, a reasonable amount of time (two minutes) will be allowed for an institutional representative to become available on the deck to assume coaching responsibilities. Interpretation: The head coach, assistant coach, athletic trainer, strength coach, director of athletics and faculty athletics representative. If the sole institutional representative for a team is the head coach and that coach receives a red card, the game will be declared a forfeit by the referee. The institutional representative may not be an undergraduate student nor an adult without official institutional responsibilities. LaSalle def. Villanova 15-13 – The Explorers recorded their first first hoe win in program history behind five goals by Sarah DeFusco. LaSalle snapped the 12-all tie with three straight scores – two by Jillian Delisle and one by Madison Martinez. Amanda Rice answered with one for the Wildcats, but it was not enough. Fresno Pacific def. Cal State Monterey Bay 15-14 SD – Cal State Monterey Bay scored seven goals to two for Fresno Pacific in the fourth period to force overtime tied at 14. After two scoreless overtime periods, FPU finally broke through with a goal by Sam Witt to clinch the 15-14 win in sudden death. Witt put in six goals, while Amy Zaninovich added four for the Sunbirds in the victory.